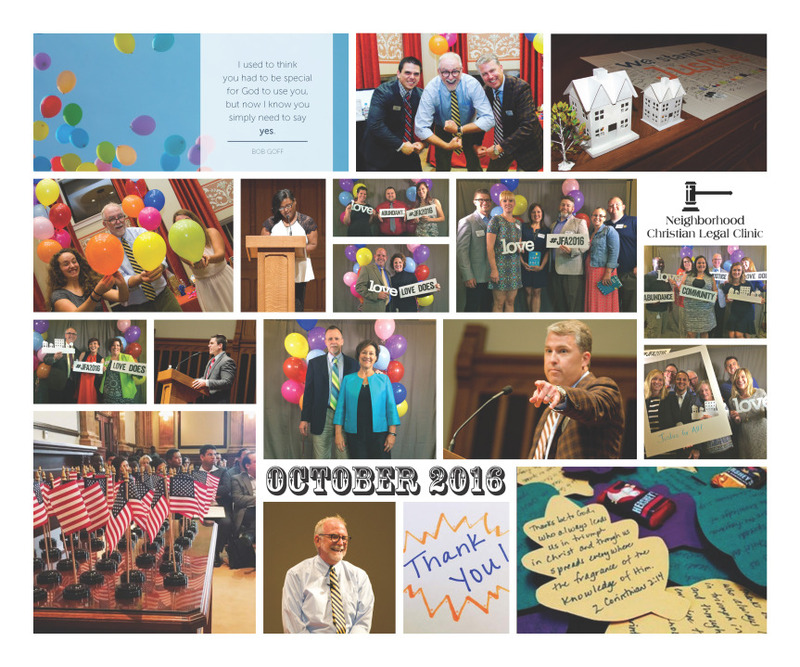 This month was one of our busiest with our annual Justice For All Gala on October 18! Thanks to your generosity, we raised the most we’ve ever raised before: $173,121! We also shared a video about one of our Consumer Justice Program clients, Ms. Dora Turner. Northview Church is proud to stand alongside Neighborhood Christian Legal Clinic in their efforts to fight for justice for the vulnerable so that all may flourish. In a world where the gap between those that are vulnerable and those that are secure continues to widen, we see the work of the Clinic as a critical bridge for the local church to live out our mandate to do justice. Through their compassionate staff and volunteers, they are on the front lines providing expertise in legal services for those that are stuck in broken cycles and systems. In many ways, our community is at a crossroads when it comes to helping our neighbors and friends achieve a basic level of justice. One path leads to increased marginalization of the poor and lost opportunities for parents and children struggling to keep their homes, find jobs, avoid persecution or abuse, or reenter society. Another brighter path leads to increased access to justice, providing life-changing peace of mind and hope for those in our community who currently have none. This month was one of our busiest of the year. Between Justice For All celebration preparations, various CLEs and trainings, and UVisa Day there was barely a free second for our staff. 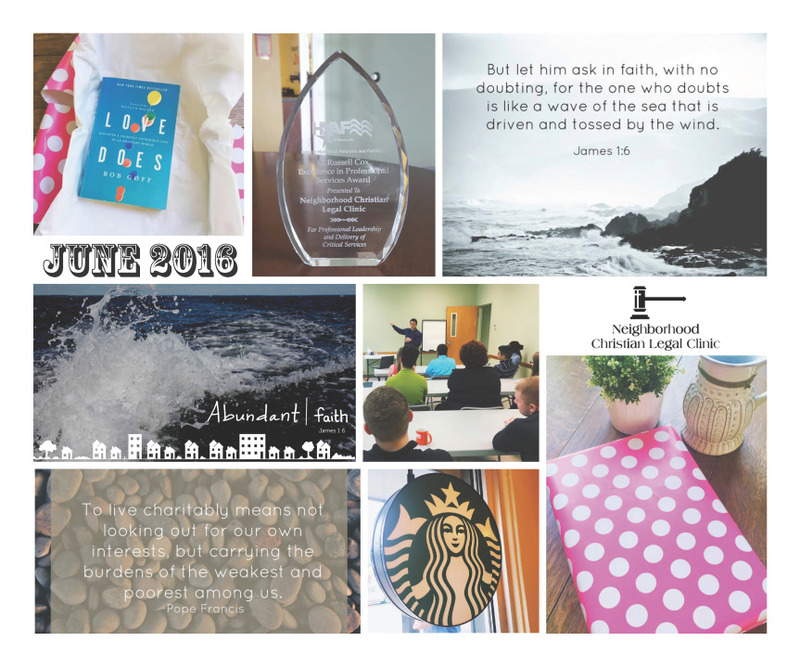 However, our theme for this past month has also been Renewal and so even in the midst of the craziness, we took time to reflect on what it means to be renewed in all the different areas of our life and work. If you were unable to attend JFA on September 23rd at the Westin Downtown, you can still see the fun photos above in this month's collage. You can also watch the video that we premiered at the end of the event and that tells the story of three different clients and the attorneys and staff who worked with them. Our organizing theme for JFA 2015 was Renewal. At the event, Executive Director Chris Purnell talked about where we're headed as an organization and why renewed passion and purpose for Christ and for our clients is so important. He then told the story of a couple he was able to assist early in his career at the Clinic. After he helped the couple, the wife mentioned it was her birthday and began crying. When Chris asked her why she was crying, the woman responded, "This is the best gift I've ever received." Chris then asked attendees to prayerfully consider a donation to the Clinic, reminding them that this donation might be the best gift someone else has ever received. There is rest to be had in ministering to others. As Tim Keller points out, there is a freedom to self-forgetfulness. Serving others, fulfilling others’ needs, actually fills you. But there is a rhythm that’s modeled for us in the Bible. After fashioning everything from nothing, God set aside one entire day for rest. God rested to show that he was God and that His creation was good. When we enter into that rest, we too are renewed by the understanding that God is God and that His creation is good. When I rest, I realize, shockingly, that the world doesn’t depend on my awesomeness in order to continue. It depends on God’s. 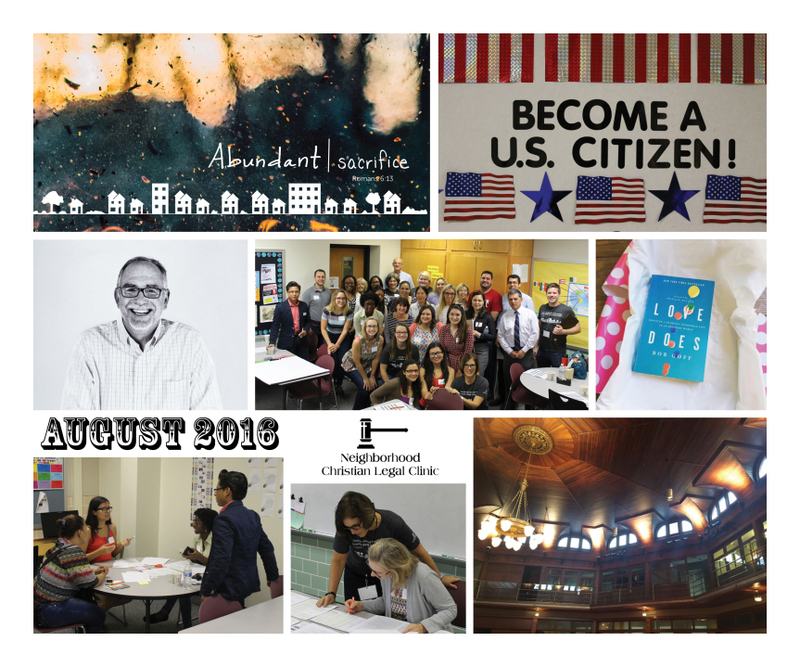 During this last month of summer, we at Neighborhood Christian Legal Clinic focused our minds on the theme of Forgiveness. The blog highlighted Project PEACE, a program that helps those who are going through a Family Law conflict resolve their issues outside of a courtroom. We met an immigrant couple who became tangled up in the confusing and convoluted tax code, but who then received assistance through our Low-Income Taxpayer Clinic, as well as financial forgiveness from the IRS. Michael Hurst, Executive Director of Legacy House, discussed the free counseling services their organization provides to victims of violent trauma. And finally, we invited you to join us at our biggest annual fundraiser, Justice For All, which will take place on Wednesday, September 23rd. There's still time to support the Clinic and the work we do! Please purchase your tickets here. This year, at Justice For All, we’ll be looking ahead to the Clinic's next 20 years of service, celebrating the renewal of our communities as we continue our commitment to seek justice for our most vulnerable neighbors.